Beaufort is a firm, raw cow's milk cheese associated with the gruyère family. An Alpine cheese, it is produced in Beaufort, which is located in the Savoie region of the French Alps. Beaufort is produced in the Beaufortain, Tarentaise and Maurienne valleys, as well as parts of the Val d'Arly valley, all located on 450,000 hectares of the Savoie region. The cheese is prepared using 11 liters of milk for every 1 kg of cheese desired. The milk used in one variety comes from the Tarentaise or Abondance cows that graze in the Alps. To make Beaufort, first, the milk is heated and then cast into a beechwood hoop or mold which gives the cheese its distinctive concave shape. It is pressed for 24 hours, taken out of the hoops and then cooled for another 24 hours. Once cooled, it is soaked in brine and then stored on spruce shelves for one to two months. During this part of the process, one side of the cheese is hand-salted each morning, then turned over and massaged each afternoon. Once the cheese rind has reached a level of maturity, the cheese is smear-ripened with a mixture called morge which produces its strong flavor and pale yellow rind. The prepared cheese must then age for 6–12 months, or even longer, in a cool mountain cellar. Beaufort cheese is pale yellow, with a smooth and creamy texture and lacks holes like other Gruyère-style cheeses, Comté, Vacherin Fribourgeois or Emmental. 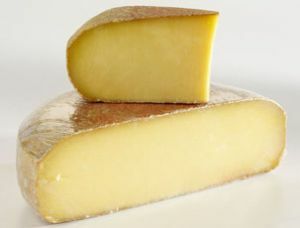 Beaufort also has a very distinct aroma, sometime described as strong or mildly pungent and reminiscent of the pastures on which the Tarentaise and Abondance cows graze to provide the milk used for the cheese. Beaufort is commonly used to make cheese fondue because it melts easily. One of the many cheeses that go well with white wine, Beaufort is often enjoyed with fish, especially salmon.